Relics of Annorath is a 3D MMORPG which plays in a medieval/post-modern ambiance. It provides a complex economic system, which is also reflected on the profession system of the individual characters. The game provides as much freedom to the player as possible, this covers a dynamic changing world with a complex guild, faction and political system that can change nearly everything in the player experience. 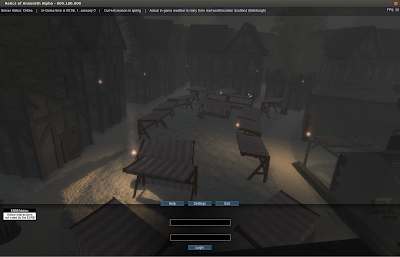 Relics of Annorath is based on Linux friendly Unigine game engine. The game is under development and it features really beautiful graphics and effects. A new alpha of the game has been released. Game developers are aiming to test network mechanics with this build. So, you won't find a full playable game yet, but you can help the developers by providing information like your graphic card type, CPU type, game FPS etc. For more information, see this forum post. You can download the game for Linux from here. Sign up for a game account from here.